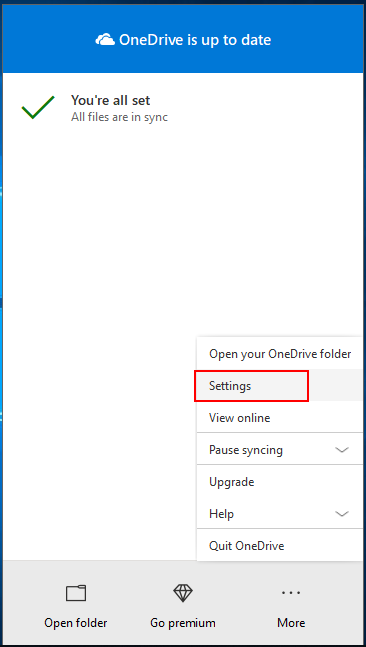 How to Sync My Documents with OneDrive Windows 10/8/7? Home / Products / How to Sync My Documents with OneDrive Windows 10/8/7? Microsoft OneDrive released a special function to help users protect their Documents, Pictures and Desktop folders by automatically syncing important folders to OneDrive. All synced folders will be safe even if you unlink or lose your PC. Recently, Microsoft has updated its method for automatically syncing Documents folder from local computer to online OneDrive cloud storage. Therefore, you can view files in Documents folder on any devices even if you unlink the source PC from OneDrive desktop application or lose your machine. Also, automatically backup important documents to OneDrive is a way to protect them from ransomware attacks. If unfortunately your local device is attacked and data get lost, you can still recovery them back from OneDrive cloud. 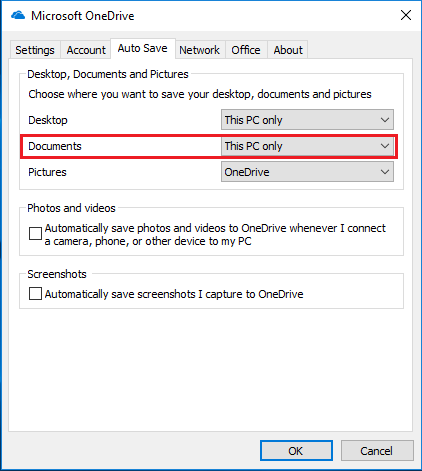 How to Sync My Documents with OneDrive Windows 10? Users who will ask this question are new OneDrive users or old users who are not familiar with the change of automatic document folder synchronization. Here, let’s go through the process step by step. 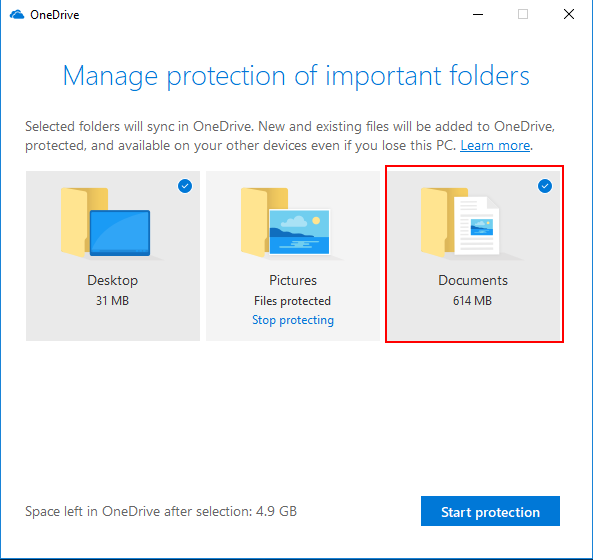 Tips: For Win10 OS, the OneDrive App has already been installed on your system C Drive. Therefore, there is no need to download and install it again. For other Windows operating systems, like Win7, 8 or 8.1, you may have to do so. If you are new users of Microsoft OneDrive, you should first of all create an account of it. If you already have a Microsoft account, you can directly sign in with the account. You can also sign in with Gmail. 1. Open and sign OneDrive App. You are able to find it in Start either by looking for it or by searching it out. 2. Click on its taskbar icon and click More (the tree dots). 3. In the pop-up list, select “Settings”. 4. Next, move to Auto Save tab and choose “Upload folder”. 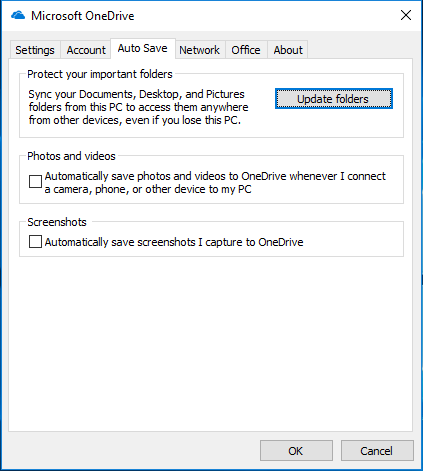 You can choose to automatically back up photos or videos to online OneDrive once you insert camera, mobile phone or other external device to the computer. You can also decide whether to automatically save screenshot you capture to OneDrive cloud or not. 5. In the pop-up window, make sure Documents folder is checked on the top right of the option and click “Start protection”. Microsoft will automatically check the unprotected folders for you unless you have already included them. If you want to stop automatic word document backup, just click “Stop protecting” under the Documents column. The former automatic Documents folder sync is also easy, you just need to select “OneDrive” in the drop-down menu next to Document option. Thus, in my personal opinion, this update of OneDrive auto documents sync is not a big thing. If you want a direct and automatic file sync from one OneDrive account to another, like from OneDrive personal to OneDrive for Business, you can rely on a powerful third party program called MultCloud. As a multiple cloud drives manager, it additionally provides you with several ways (sync, backup and transfer) to exchange data among different cloud drives, either of the same cloud brand or of different cloud brands. Copyright © 2018 MultCloud. All Rights Reserved.